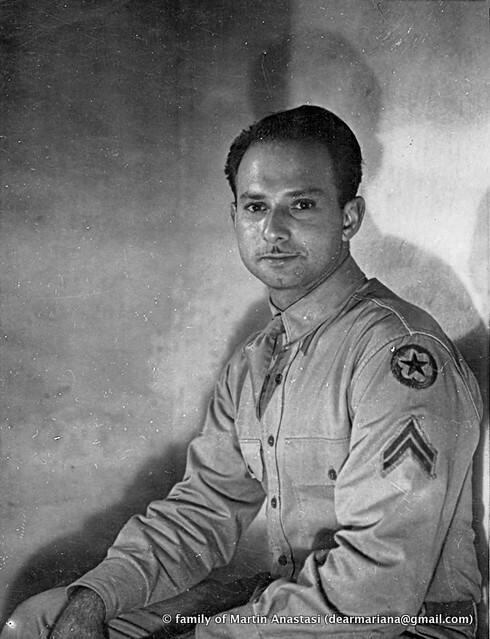 Was your grandfather allowed to have a camera because he was in the Army Signal Corp? He may have been the soldier who took the shot that was shown in Life magazine and he also took another shot that was not in the magazine. However, some of the American soldiers had cameras that they had liberated from German soldiers who were encouraged to carry cameras. I am not sure what the Army Signal Corp is, but I’m fairly certain it was his own camera – based on the number and location of other photos from the same film. I’ll look in his military records and try to figure it out, but we were always told that he was one of (if not the only) soldier allowed to have a camera that day. The way I always understood it was that the Americans had set up the shot, and something about a LIfe photographer being there as well… which was not him. I’m in the process of asking my aunts and uncles what they remember him saying about this photo, so maybe I’ll know more soon. I just thought it was interesting that everyone online is saying it was for an East German film… which doesn’t seem right. Quick update: based on my quick Googling on Signal Corps and my grandfather’s military records, I don’t think he was in that. He may have had a camera which he “liberated” from a dead German soldier, since German soldiers were allowed to carry cameras. Could you post the photo, so that we can determine if the photo was taken with a Leica or some other German camera, or whether it was taken with an American box camera? Few people in America, except for professional photographers, had an expensive camera in those days. How was the film developed? Did he bring the film home to be developed? Was it developed in a typical American professional lab, which can be seen by the way the photo was printed? Is the photo square or rectangular? What kind of border does it have? Oops, I’d appreciate it if you delete that previous comment – accidentally posted it from another account… embarrassing. Can you delete that quickly please? I deleted the previous comment. I looked at the photos. They were probably taken with a 35 mm camera. The photos are excellent, although the quality of the camera is not so good. The person who took these photos was an experienced photographer who was a sensitive person with an eye for beauty. 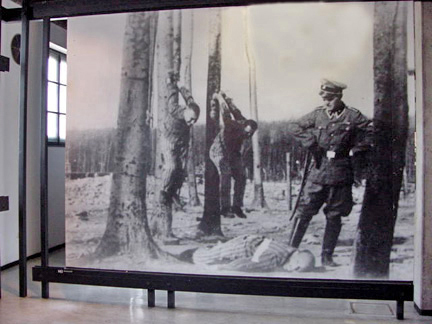 I saw the two photos of Buchenwald. One of the photos shows a tank just inside the gates of the camp. This means that it was probably taken just after the camp was liberated. 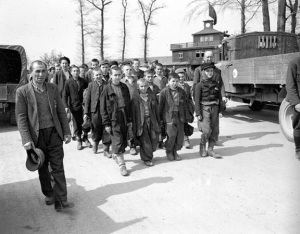 The soldiers who are entering appear to be coming into the camp to see it AFTER it was liberated; they do not appear to be actively liberating the camp at that point. Very nice collection of photos. Thanks for sharing them. Do you think Jack Werber needed to “lie” to William Helmreich, director of the Center for Jewish Studies at Queens College? Did (Prof?) Helmreich care if Werber was telling the truth or not? It was known before 1996, when the Helmreich/Werber book was published, that this photo was a fake. If I’m wrong about that, someone please give me the details. Oh my. And what did this eyewitness actually see? We’re supposed to just take his word for it. This is the kind of “documentation” that we get from heads of Jewish Studies departments in our colleges and universities. Thanks, FG, for writing this and asking these questions in the search for truth. Such a rare commodity. Thanks for pointing out that the photo was known to be fake in 1995 before the book was written. This makes me wonder if “Baumhängen” actually took place at Buchenwald or at Dachau. The Dachau Museum left this photo up until 2003 when the whole Museum was redone, even though it was known in 1995 that the photo was fake.